Active Feet Podiatry is a podiatry practice established by Alexis Medina in 2007. We have most recently moved into a conveniently located multidisciplinary health practice in Collins Lane, Kiama. 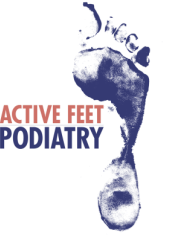 At Active Feet Podiatry our aim is to provide you with a comfortable treatment environment, one where we are dedicated to providing thorough, friendly, professional and honest advice. We are university trained to assess, diagnose, treat and rehabilitate all injuries and pathologies of the lower limb. This can range from general foot care, to more comprehensive and complex podiatric complications. Active Feet Podiatry aims to find a permanent solution to your foot problems, not just alleviate the pain temporarily. Even mild pain can get worse and lead to serious complications. So please call us to make an appointment. Active Feet Podiatry adheres to the Australian guidelines for the prevention and control of infection in healthcare from the National Health and Medical Research Council.